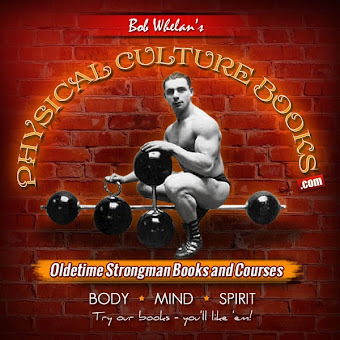 You will notice in the previous chapter that although I set out to find the bogey in forearm and calf development, I did not write much about the forearms. Towards the close of the chapter, I did call your attention to them, but I purposely let the subject slide for different reasons, all of which revolve around the fact that so little seems to be known about successful calf and forearm building. It must be this, otherwise we would not be so everlastingly confronted with complaints of failure from so many who crave muscle upon these two sectors. If there is a bogey, it is in lack of knowledge, and in absolutely nothing else. I devoted practically the whole of the last chapter to calf construction, and I find if I am to give you the best forearm information, it is going to take at least two chapters. But I believe your interest is strong enough to stand it, as I know you will find much refreshing information as your interest will be centered around new material. The title of this chapter may lead you to believe that the forearm is not going to be very much discussed in this chapter after all; but it is, and thoroughly. I chose that title because I want you to get the idea out of your head, that you have to own large wrists before you can own a better and larger forearm. It is the forearm that makes the wrist, rather than the wrist making the forearm. I have listened to the wails of scores of young men who lament that they will never have a decent forearm because their wrist is far too small; and that is the accepted idea. But it is wrong. You have to get the forearm first, and in order to get the forearm you have to get the grip. We always see a powerful clasp go hand in glove with a strong forearm. However, you can readily recall many friends who apparently have a strong hand clasp but no unusual forearm size. That is true. You will find salesmen have a hand clasp above the average, but they specialize on that grip only, and are often on the look-out to take a quick grip and secure an advantage over the ordinary person, who usually is not interested in hand clasping resistance. Yet there is no denying the fact that when these worthies shake hands, the wrist ligaments are fairly prominent. On the other hand, they soon know when they meet a strong armed man. There is something in a strong clasp. Everything we pick up in our hands calls for a certain amount of grip. That grip calls into motion the forearm muscles, and the ligaments of these muscles control the wrist and hand movements. This is the case and the common assumption that the wrist controls the forearm and the grip of the hand is all wrong. Your grip will always be measured by the amount of forearm strength you have, and your ability to carry objects and raise them off the floor. So in order to increase the forearm muscles, we have to cultivate our gripping qualities to their fullest, and the wrist will be taken care of automatically. It has taken up a large number of words to tell you what I mean when I say "get away from the idea because your wrist only measures six and a half inches or seven inches, that it has placed a fatal seal on your possibilities for forearm growth." Get over this idea that a very ordinary fellow you know having naturally a seven and three-quarter inch wrist has it all over you. This is not so. I don't say you will make an eight inch wrist out of six inch wrist, but I know you can improve it a lot, and its quality will manifest itself in the strength and shapeliness of your forearms. Many people naturally have very heavy bones around the wrist. Well, you can't offset that, but you can acquire thicker wrist cables, and the bones will slightly increase their structure, from resistance, as it is applied in its proper place. A lot of exercisers write to me to complain that when they do that certain leg exercise where they straddle a bar bell and hold it in their hands while they do a slight knee bend, their grip plays out before their legs get their workout. In their mind, it is always their poor grip, but they are mistaken; as the forearm strength and hand grip of no man was ever sufficient to cope with the vigorous play of which the large hip and thigh muscles are capable. There is too much disparity in the relative strength of these separate members of the body. The best way to overcome this, so that the legs get the best results, is to make a harness of canvas to fit over the head and rest upon the shoulders, with a hook sewn in at each end. 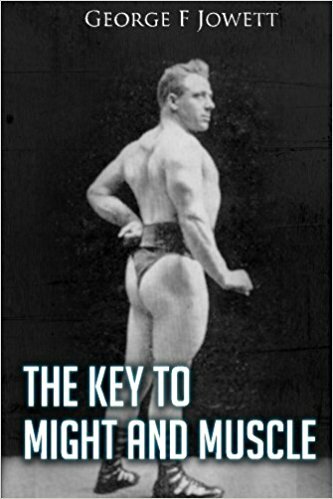 You simply allow the bar bell to lie in the hooks, and the body supports the weight instead of the grip. Some have more trouble than they ordinarily should with this exercise. They find that the weight straightens their fingers out and pulls away. This cause is as much the lack of finger strength as of the hand grip, but the next chapter is going to be devoted to the cultivation of finger strength, so I will stick to my initial discussion. There are numerous muscles in the forearm, which are classified as pronators, extensor and flexor muscles. The pronators are the muscles of rotation, while the extensors straighten out the arm, and the flexor bends the forearm upon the upper arm. Taking our first survey on the anterior forearm, which is the front, we find four muscles that have a common origin, on the extreme end of the humerus bone, at the elbow joint. They divide and spread, to compose the bulk of muscle so pronounced on a well developed arm. It is the second muscle from the inside that has the largest bulk of the four, and possesses the roundness which gives the canoe like shape to the front of the forearm when in repose, and is more forcibly evident when flexed. They are some of the pronator muscles and flexors. The muscles on the dorsal part of the arm are seven in number, and included among these is the supinator longus, also known as the Brachio-Radialis, which is the most important extensor muscle in the forearm. Running by its side is the Extensor Carpi Radialis Longus, which is the accessory extensor muscle that co-operates with the supinator. The great peculiarity of our forearm muscles is the strange way in which they are capable of twisting. The supinator longus and its accessory muscle have a remarkable spiral twist to them. It arises from the humerus bone (on which the biceps rests) underneath the bicep, but twists over the outside of the elbow joint to become attached to the front of the forearm. I am inclined to believe that the supinator longus is the most important muscle in the forearm. It is capable of rotating, flexing, and powerful in extending or straightening the arm. It sets an arm off also, giving breadth to the arm at the elbow when viewed sideways. Did you ever notice the arm of a pick and shovel laborer or a man who is accustomed to carry objects in his hands? For instance, a railroad porter. Of course, the majority of porters keep their arms covered, but if you ever see one with his arms bared carrying a heavy object, just notice the forearm at the elbow and you will see what appears like a deep indentation and then a hump of muscle. That is the effect this muscle gives to the arm when an object is being carried. On the arms of porters, it often is pronounced, and also upon laborers. Just clench your fists, and thrust your arms straight down by the sides, then bend the wrist back to the outside, and notice how this muscle stands out. Yet another interesting way to view this muscle is to bend the arm so that the fist rests upon the chest. Bend the arm more forcibly upon the biceps by employing the other hand, and the muscle will accentuate greatly. Then while in this position, twist the wrist and just notice how firmly it becomes tensed in the process of a wrist rotary movement. When a weight is raised overhead, and held at full arms' length, it is this muscle and its accessory muscle that do all the work, co-operating with the triceps of the upper arm. The other muscles being flexors should never be employed to any extent when raising a weight overhead, as they counteract the extensors. The muscles on the front of the arm, being flexors, apply their force more powerfully in movements that bend the arm at the elbow. Their contraction is even greater whenever any object is being raised towards the shoulder while the hand is bent at the wrist, downwards. Forearm builders liken this position of the arm to a swan's neck, as it is the position which a youngster will form with his arm when patterning a swan on a shadow screen. This is why, when advising a person to practice a movement with the wrist turned downwards, the movement is termed a swan's neck formation. It is the flexor muscles on the front of the arm and the supinator muscles that are always the least developed among beginners. It is in these regions that muscle builders, with poor arms, fall down. Well, we cannot blame them too much, because like calf exercises, they only seem to know one or two exercises, and that ends it. When a person becomes more familiar with the uses of these muscles, he can see that something else, in the way of exercise, has to be done. I am satisfied that if any of you follow out the advice I am going to give you will soon be piling up muscle on those stick pin arms. You may wonder how your wrist will become improved by any forearm practice, so before we go any further let me enlighten you upon the fact that the muscles all taper off into ligaments. The weaker the muscles, the more stringy and thin are these cables. The stronger and bulkier they build up, the thicker the ligaments become. As these ropes of connection taper off at the wrist, it is only a natural condition that the wrist size should be increased. When I commenced heavy exercise, I only had a seven inch wrist, just an average size as I have said, but today my wrist measures every bit of eight and a half inches. The sinews that have massed upon the wrist are very heavy, and have powerful contraction, and perhaps I am justified in the joy I take in my forearm strength, shape, and size. It measures fifteen and a quarter inches. I practiced many forms of exercise to which I owe my success in arm moulding. In one of my writings I have made the statement that forearm growth never seemed hard for me to secure. The truth of the fact is this, although I certainly did a lot of work on my forearms, yet I never actually noticed it. You see the exercises I performed were more in the line of stunts, and I played at them as you would a game. These stunts were a never failing source of interest and pleasure to me, that reminds me of the old saw that we never do anything so well as the things we like. Unfortunately, exercise has a tendency to become monotonous, especially when the number of exercises are limited, and as I have inferred before, I believe that reason is the cause for lack of calf and forearm development -- lack of knowledge. Exercise must never be a grind; it must be a pleasure, and have the qualifying results to always supply the urge. When I was a young boy, we did not have the variety of fine outfits the present day body culturist finds. We used to play a lot with block weights of different weights. 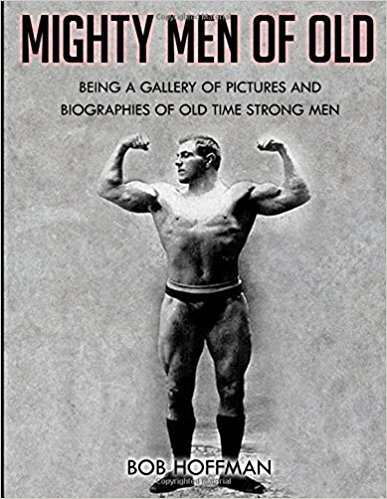 The half hundred weight was the most popular, and I well remember that my first strongman outfit consisted of a very short piece of a broken steel shaft, that weighed about forty pounds and was about three inches in diameter. A very unwieldy implement for a fifteen year old boy, you will admit. My other "weapon" was an old half hundred pound block weight. With these implements I commenced my adventures into strengthland with visions of myself as Hercules not far ahead. As time went on, I became very adept in handling this block weight, and when I was sixteen years of age I could duplicate all of the regular feats with ease. Of course, most of these stunts involve a good grip, but while I did not have this valuable asset in the first place, I gradually acquired it from training. The shape and size of the hands have a lot to do with many of these feats. Some people naturally have large hands, which give them a greater gripping space, but my hands were only of the average size. The hand itself is broad, but the fingers are short. It was not much of a handicap, and I figured that we cannot have everything; so it is up to each of us to make the best of what we have and offer no excuses. The regular grip and forearm exercise really was a bore to me. I could not see the idea of holding the arms straight out in front, winding up a weight tied on a stick. My shoulders always became tired before I got the right effect upon the forearm, so I changed it a little, on the principle that the muscles intended for that exercise should be the flexors of the front forearm; yet by holding both arms straight out in front, the action was being absorbed just as much, if not more, by the supinator extensors. Just as the gastrocnemius of the calf have greater contraction when the knee is flexed, I figured the same thing would happen to the forearm. Instead of holding the arms straight out, I bent them considerably at the elbow, until the formation of the arm with the body represented the letter V. I found I could handle much more weight this way, which gave a more powerful play to the flexor muscles, and all the former shoulder fatigue was eliminated. Where before I found thirty pounds tired my shoulders and not my forearms, I could then handle fifty pounds with the right effort directed upon the proper quarters. Most exercise fans imagine that chinning the bar with both hands is entirely a biceps developer. It certainly has a splendid effect upon the upper arm, but it also gives the forearm very vigorous play. This was also part of my practice, with the following variations. Suppose I was going to chin myself a dozen times. I would divide the repetitions in this manner. Catching the bar with both hands in the regular grip, I would chin three times, thenm reverse one hand, so that one palm was facing me and the other would be turned away. Next three chins would see both hands reversed, so that both palms were facing me. The last three chins I would do entirely differently; taking hold of the bar with the regular grip, but with the forearms crossed, in a position so that the right hand would be where the left grip would be ordinarily taken, and the left hand would be in the regular right hand place. This chin is rather difficult and calls for a lot of arm strength. In the first place, your hands cannot be spaced much apart, and you will not be able to chin your weight so high. At the same time you will find that your body has a tendency to spin around. The fact that you have to fight these conditions is just what will bring the most out in your arm development. It is not necessary to practice these chins in the rotation I have just given. I would do the hardest first, and leave the easiest for the last, which will be hard enough as you tire. My main object was to see how well I could chin instead of how many times. Too many young chaps figure it is greater to chin thirty times than fifteen. Numerically it is, but the results are not the same. The chinning fiend chins fast, and swings his body to aid the pulls, but that is no good. Too much lost motion. I would rather have twenty-five correct chins as my record than fifty otherwise. When a bunch of enthusiasts would get together, we would tie weights on the feet and see who could chin with the most weight. A heavy man will not chin as many times, or handle as much weight on his feet, but we always made a weight allowance in such a case. I remember some of the boys could chin with a friend hanging around their waist. Anyhow these stunts certainly improve the grip and the forearm. Just try them for yourself. Many enthusiasts claim that their wrists are too flexible to allow them to perform many ordinary movements of the forearms. Now I hope this statement will not convey to you the idea that a wrist should be almost rigid in order to be strong. A strong wrist is always flexible. The difference is that the weak wrist has no control over its flexibility, which invites wrist strain, when the wrist is bent beyond a certain angle. The strong arm man always has control. Just notice the acute angle to which the weight lifters and hand balancers are capable of bending their wrists, and yet have them under wonderful control. 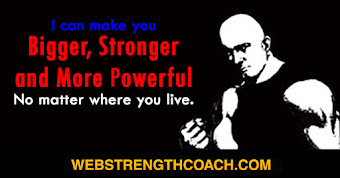 It is all in the strength of your forearm muscles and their ligaments. The novice in hand balancing always feels a stiffness at the wrist when making his first few hand stands on the floor, but practice accustoms the wrist to bend to the angle and strengthens it. The same applies in heavy weight lifting, which is the reason why bar bell users have powerful wrists. It annoys me to see a novice wear wrist straps. It is so unnecessary and unnatural. Your muscles were made for a purpose and that was not to wear wrist straps. They only tend to weaken the wrist by absorbing the resistance that the ligaments require, which keep the wrist weak and prone to strain. If you have strained the wrist, that is different, but cold water bandages will relieve the strain and help toughen the sinews. Don't use a wrist strap any longer than necessary. Professional athletes only wear them for show purposes, to set off the looks of their arm, and the material is always of light flexible leather. Strengthen your wrist by natural means. In passing, I might mention that it is the downward pressure upon the bones of the arms, as involved in lifting heavy weights and hand balancing, that increases the thickness of the bone structure. Here is a clever exercise for the grip and wrist, which makes the pronator muscles of the forearm go the limit and also develops a spectacular stunt. Grasp a bar of about fifteen or twenty pounds in the center by the right hand; give the bar a twist to the left, and allow it to make a full circle before you catch it with the left hand. Immediately the left hand grasps it, let it go from your right hand, as the right hand will have traveled the limit of its rotary extent. You simply catch the bar with the left hand long enough for the right hand to untwist and catch it in its natural hold. It looks as though both hands are operating, but it really is the right arm that is doing it all. The left hand is just an accessory. Always catch with the left hand above the right hand, and be sure to allow the bar to make a full circle before you change hands. It looks great when you get it down so pat that the spins are rapid enough to make the "whirlwind circle" as the feat is named. Do not practice with one arm only. Give both arms their share, and you will find a great kick is supplied to the pronator muscles. A variation of this is practiced by using only one hand. However, in this it is necessary to support the elbow on the hip. 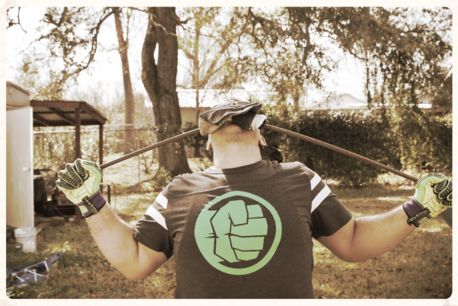 As the wrist reaches the limit of its turn, give the bar a slight heave and catch it as it circles. When you get good at this, you can use both hands. As one circle is made and the grip of the right hand is released, the left hand catches and gives a turn, keeping the bar going from one hand to another. Before you practice any of these more advanced feats, train yourself by holding a light bar in the hand and allowing the bar to revolve, twisting the wrist as far as possible; then stop the twist without letting go, and turn the bar back again. Do it slowly. It is just a series of to and fro circles made by the wrist. Keep the elbow on the hip as a support and an aid throughout the practice. In a minor way, twisting a dumb-bell has the same effect upon the pronators. For the supinator longus and its accessory muscle, a splendid exercise is performed by standing erect with the feet together, and a bar bell of twenty-five pounds, hanging at arms' length, held in front, across the thighs. From this position you slowly raise the bar bell in a quarter circle until the arms lie parallel with the shoulders. As the bell is raised, bend the hands upwards upon the wrist. The reverse of the swan neck formation. It is the position of the hands that controls your success. Keep perfectly straight, and do not bend backwards or seek to aid the raising of the bar bell with any swing from the body. The arms must be locked at the elbow so that they are straight, and another little thought to remember is that the movement is just as effective when lowering the bell as when raising it. Although the main purpose of the exercise is to develop the supinator longus, yet it is a fine exercise for the whole body. For the muscles on the outside, or dorsal side of the arm, the following exercise will be found effective. Stand erect while holding a dumb-bell in each hand averaging anywhere from fifteen to twenty-five pounds each, according to your strength. Let the arms hang by your sides and before you begin the exercise bend the hand upon the wrist backwards. Then begin to raise the arms up sideways. It is not necessary that they should be raised so high that they reach the level of the shoulders. 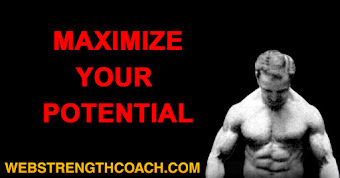 Raise them as high as you can, as it is the forearm muscular action you want. When you get beyond half way to the level of the shoulders, the triceps and deltoids begin to take the aggressive, and you should not be interested in deltoid and triceps development when practicing this exercise. You can tell if you are doing it correctly, as the ends of the dumb-bells should lie horizontal with each other throughout, not endways to the floor. But the important part is how the hand is bent. You cannot watch that point too closely. If the hand is held too straight with the forearm, you will feel a wrist strain; if it is in the correct position, you will feel a strong muscular contraction. One time a friend of mine was showing me through a foundry where he was employed, and on our tour of inspection he remarked, knowing I was interested in well formed muscles, that he would show me a wonderful pair of arms. Coming to one part of the foundry he drew my attention to a man who was picking up various metal castings and placing them upon a low truck. He surely had fine forearms and the muscles on the front of his forearm bulged massively. There were a number of block weights all ranged on the floor, which this workman began to place on the truck. As he did so, I noticed how the flexors of the anterior forearm displayed themselves. I continued to watch him, but he never tired, and right away it flashed through my mind how he got those forearms. 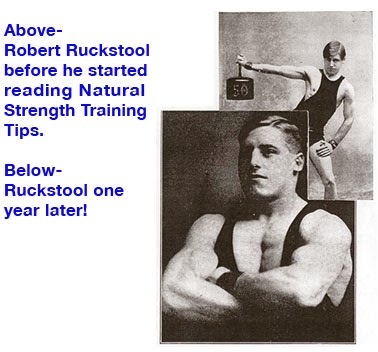 He was stooped over most of the time, and never raised the weights over waist level. This naturally gave the strongest play to the flexors, and from that lesson I devised the exercise of pulling the kettle bell to the chest, keeping the elbow close to the side, and bending the hand upon the wrist with a swan neck formation. I would steady myself by placing the disengaged hand upon the corresponding knee, and lift the kettle bell from between the feet as many times as I was comfortably able with a poundage of fifty pounds up. 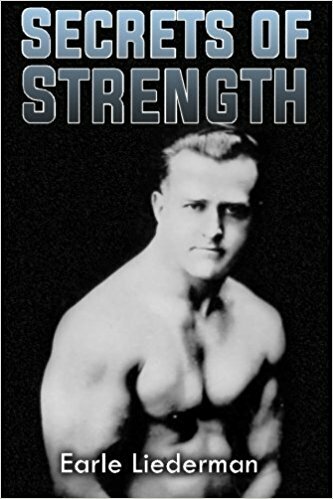 Standing erect after lifting a heavy bar bell off the floor, employing both one and two hands in two separate lifts, is very good; and the thicker the bar, the greater gripping strength is demanded. Men with large hands and long fingers can encircle thicker bars, although a person can use too thick a bar. The block weight can supply many fine arm tests, which incidentally build up the arm. You know what I mean by a block weight, I suppose. It is a square piece of iron scooped out on one side with a bar inset, by which it is lifted they weigh around fifty pounds and are generally used for testing scales. The object is to be able to grip them tight enough so that the bar does not revolve in your hand, and allow the weight to rest on the side of the arm, which is not very pleasant. Some of the stunts you will find interesting, so I will explain a few. One of the easiest is to sit on the floor with the block weight by your side, and with pure arm movement, raise it off the floor over the first leg. Touch the floor between the legs, then pass over the far leg and touch the floor, and return in the same manner. However, to do it right you must not allow the weight to touch the legs, and you must seek no aid from the body by swinging with the motion. Next, pull it to the shoulder and press it overhead keeping the weight all the time above the hand. A very difficult feat with which I have stuck most of the strongmen is done like this. I would stand erect with the block, or scale weight, hanging by the side, and by arm strength curl the weight with the hand bent down in swan neck fashion. After I had bent the forearm upon the upper arm as much as possible, I would pause; and with a pure wrist movement--no shoulder action--I gripped the bar and twisted the weight so that the weight was balanced by the grip above the hand, and the hand straight with the arm. Then I would lower the weight without bending the elbow, just the wrist, and raise it back again, then describe a circle with a rotary hand movement. Another real feat is to raise the block weight from the side, keeping the wrist straight with the forearm and the weight in the same straight line, with the hand and forearm. Raising the weight until it is at right angles with the body, but the feat lies in never losing control of the weight. An easier one is to sit on a chair and raise the block weight off the floor, and place it on the table by your side without raising off the chair or using the other arm. One of the greatest feats of hand grip and forearm strength I ever ran up against was in a blacksmith sop. It was an old feat practiced around the blacksmith's forge in the day when the smith was looked upon as the true personification of real strength. Many wonderful feats were seen and others talked of in the gleam of the old smithy forge, but with the decay of that picturesque occupation many of the kings of the iron arm passed. In the old days, anvils were made in various sizes, and in a smithy shop you could always find three or four of different weights. A light anvil would be about seventy-five or eighty pounds and used for straightening nails, or light riveting. The others averaged around one hundred forty pounds to one hundred sixty-eight pounds. Where heavy forging was done, anvils much heavier were used, but the last two named seemed to be the regular thing. 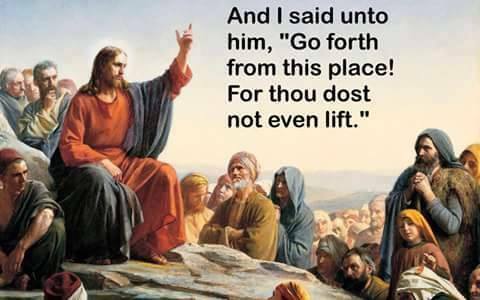 If any new comer wanted to try his strength they would ask him if he could lift an anvil with one hand. This was done by standing the anvil on end with the horn pointing upwards. The horn is a very thick conical affair that runs abruptly to a point. You were supposed to take hold of the horn with the hand and raise it off the floor. I have seen several raise the seventy-five or eighty pound anvil high off the floor, but I only saw two ever lift the one hundred forty pounds anvil; while on three occasions I successfully raised the anvil of one hundred and sixty-eight pounds. It is a very severe arm test, and if a man had the grip to raise any of these anvils in this manner, he always had the forearm to make it possible and the wrist to sustain both.